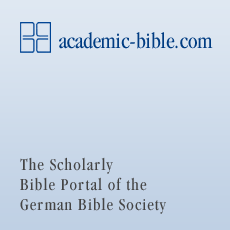 The German Bible Society (Deutsche Bibelgesellschaft, GBS) distributes more than half a million Bibles annually, including numerous scholarly editions and additional resources for biblical study. The German Bible Society is renowned worldwide as the publisher of the critical editions of the Hebrew Old Testament (BHS & BHQ), the Greek-language New Testament editions Nestle-Aland and Greek New Testament, and the Septuagint and Vulgate. At the same time, it has also acquired renown as a publishing house for scholarly resources for biblical study in printed and electronic form. Publications from the German Bible Society are used throughout the world in exegetical training and theological practice. In its publishing work, the German Bible Society cooperates with a large number of scholars and academic institutes within Germany and abroad. It is a member of the United Bible Societies and provides them with the necessary editions for their global Bible translation projects. The scholarly editions from the German Bible Society are the basis for almost all modern translations of the Bible. The German Bible Society is a non-profit ecclesiastical foundation under public law. Proceeds from the Society’s publications are directed to the various biblical missionary activities.